This entry was posted on Monday, November 17th, 2014 at 8:38 am in Contests!, General. Tagged: Guest Blogger. You can feed this entry. Both comments and pings are currently closed. Interesting theme and great excerpt. Plus I love the bike! Cora I am so excited for the next Brothers of Element Series! Congrats on your new book! Your biggest fan! Loved the teaser. Can hardly wait to read. Definitely on my TBR LIST. wow,I read a LOT of shifter books and the only water ones I have seen were selkies,I would have never even thought about a shark as a shifter,although I suppose most animal could be one,well at least the somewhat sentient ones lol these look really interesting and I will check out your site and sample one and see how they go,hopefully they are hot cause that’s the way I like them and if you are on Delilahs blog I assume that you write them that way lol,if it looks as good as it sounds I will pick one up and review it on amazon as thats where I review everything I read!! Awesome, Sharon. 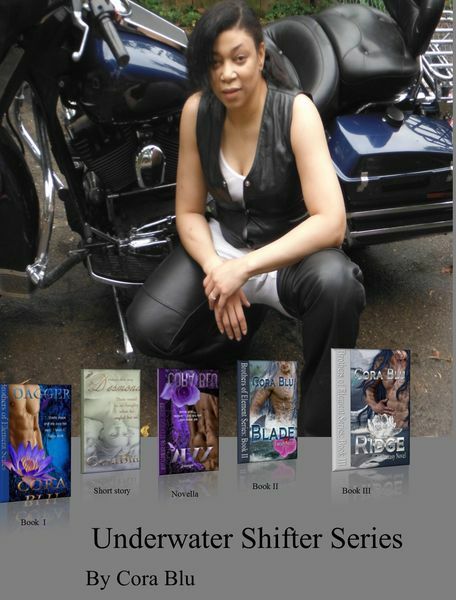 Dagger is only .99cents. Start there. 🙂 Each heroin is a different nationality depending on what body of water she’s from. Dagger’s is African American. Blade’s is Japanese. Ridge’s is Russian, Alaskan. Thank you ladies. I hope you enjoy and thanks for entering the give away. Interesting excerpt. Can’t wait to read the whole book! Thanks for the opportunity! Thanks ladies. I’m so glad you stopped by. Saw the comment above that Dagger is only $0.99…downloaded it. I’ve got a few (LOL! ok, more than a few) books in front of it, but I really liked the concept. Best of luck. Just bought Dagger and Max for my Paperwhite and can’t wait to start reading! One question, though–where can I purchase Desmond? I checked out All Romance and it’s not available on that website. Thanks! Glad you got a chance to catch that, Charlotte. Believe me I understand about the list. I purchased a book this morning when I should be writing. Here’s Desmond link on Allromance. It’s free there. Amazon will not make it free, so it’s .99 there. A short story. Actually it’s an apology scene between a bullshark shifter and his dolphin mate. Excellent! Thank you for the direct link! Thanks Brittany. I will select a winner and post it tomorrow. A special thank you to all the participants for your time and kind words.